Kalispell Alignment & Auto Repair Inc.
95 4th Ave W. N.
Though many drivers understand the importance of getting an oil change on a regular basis, they may be caught off guard when a “check coolant level” warning light appears on their dashboard. However, this is one tune up task that should never be overlooked. Here’s a closer look at what you should do when this dashboard warning light appears. Why Does the Check Coolant Light Matter? 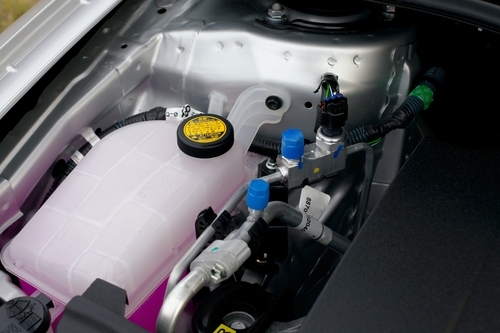 Coolant — or antifreeze — plays a vital role throughout the year by regulating engine temperatures. Not only does this keep the engine from overheating during use, but the glycol found in antifreeze actually protects the liquids in the engine against ice formation when temperatures drop below freezing. Without enough coolant, your engine could literally freeze during the winter. Coolant is generally expected to provide quality performance for 30,000 to 60,000 miles, depending on the formula. When the check coolant level light appears on your dashboard, it means there isn’t enough fluid left to control engine temperatures — which could put your engine in jeopardy. Though coolant gradually evaporates over time, a sudden loss in fluid could be the result of a system leak or an improperly functioning radiator cap or cooling system. If the warning light turns on, you’ll likely need to take your vehicle in for a tune up to check for any underlying repair issues. Otherwise, you will simply need to refill your fluid with the type of antifreeze recommended in your owner’s manual. Whether you need a basic tune up or more advanced auto repairs, you can rely on Kalispell Alignment & Auto Repair in Kalispell, MT. With over 25 years in business, their ASE-certified technicians back all work with a 24-month/24,000-mile warranty, so you can have confidence in their work. To learn more about their services, visit them online or call (406) 755-0234. Other Announcements, Events and Deals from Kalispell Alignment & Auto Repair Inc.
A. Kalispell Alignment & Auto Repair Inc.